About 50 minutes of chiptunes and similar stuff. Tested under WinXP (32/64 bit, no chance yet to test under Vista). Requires .NET 2.0 or higher. 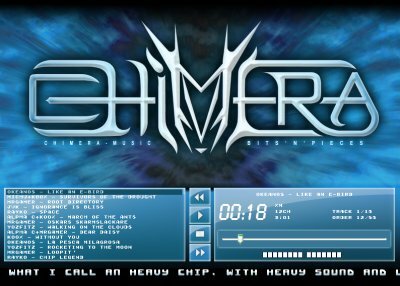 forever in <3 with chipmusic ! rulez added on the 2008-11-10 04:26:01 by ɧ4ɾɗվ. added on the 2008-11-10 04:26:43 by ɧ4ɾɗվ. I think this kind of chip music sounds a little bit too hi-fi and none of the tunes managed to catch my attention. Piggy. Good interface, low CPU usage, some nice tunes. Thumbs up! Havoc: do you have the .NET Framework installed? Loads of nice chiptunes on this disk. Great! O_O chiptunes i love them ! added on the 2008-11-11 10:49:23 by Bhl! But 18 Mb for a few chip tunes?... Err... Never mind. Anyway, I like "Space" by Rayko made in Renoise - it has 60 kb size and sounds Jarre-like. Must be the quantum module DLL that takes so much space. Anyways looks nice. And I know it will sound nice that evening at home. Oh and the size is "big" i gues because there are few OGG files in there, one wich has 18 minutes lenght ;) but everyone could have seen that. This is what I call a good disk. Nice songs, tracker format, pretty gfx. I listened to the songs with ModPlug Player and Winamp, but not the internal player. Not bad. Wow, very impressive! WONDERFUL TRACKS! THX! What can I say except that I love the musicians who contributed to this musicdisk! Great! A volume control would have been nice. Nice tunes into that muzakdisk! late thumb - excellent chips! Yes indeed, very nice tunes. Still have it on my desktop. I like the interface, but tunes are not really my cup of tea. page created in 0.018862 seconds with 15 queries.